Celebrate birthdays with the Very Hungry Caterpillar! 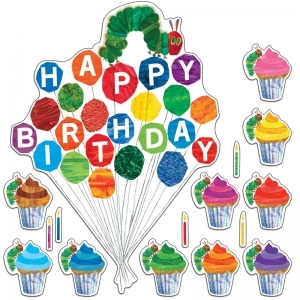 This beautifully illustrated bulletin board set Happy Birthday Balloons (assembled) 64 candles and 37 cupcakes for a total of 105 pieces. 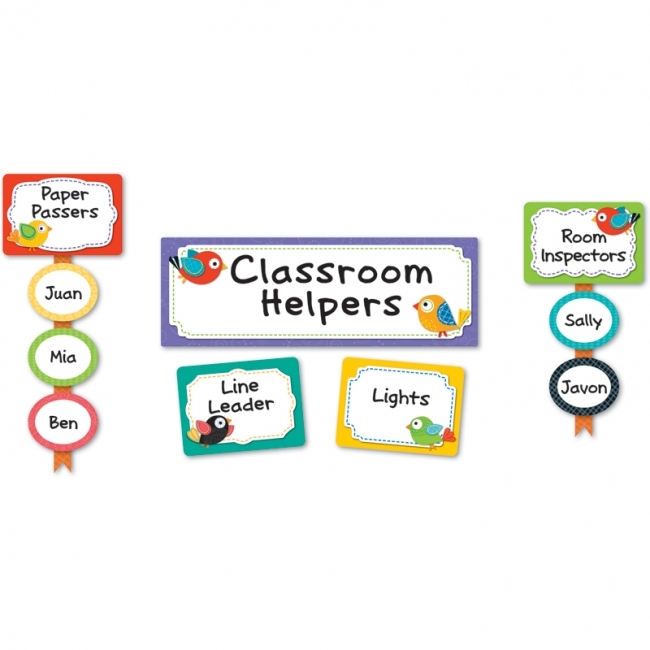 Create a positive and organized learning community with the eye-catching, contemporary Boho Birds Classroom Management bulletin board set. 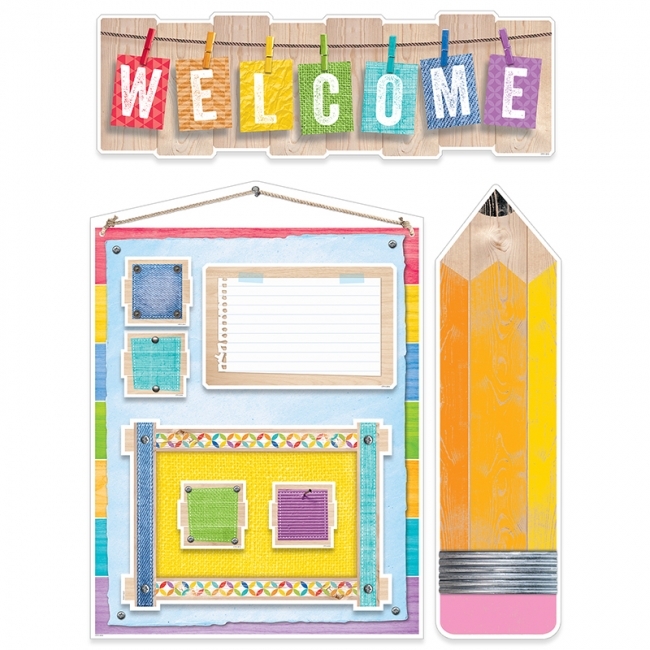 This 53-piece set includes 1 header (23 1/4" x 8"), 10 large frames, 30 student pieces, and 12 ribbon strips. 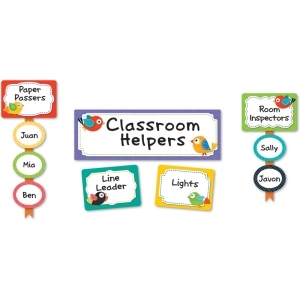 This eye-catching, contemporary Boho Birds design will brighten any classroom! Create an eye-catching classroom management display with the Colorful Chalkboard Classroom Management mini bulletin board set. 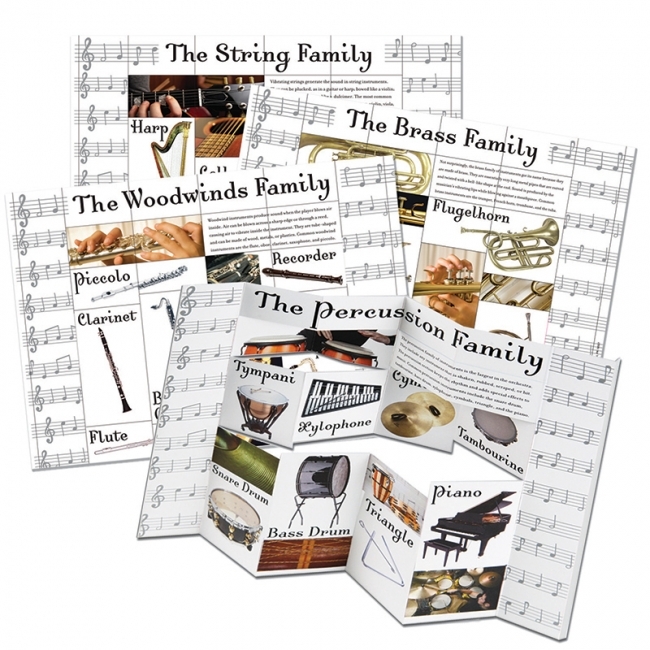 This 47-piece set includes 1 header (20" x 5 1/2"), 8 rectangular frames, 8 striped frames, and 30 student pieces. Each piece features a large writing space for easy customization. 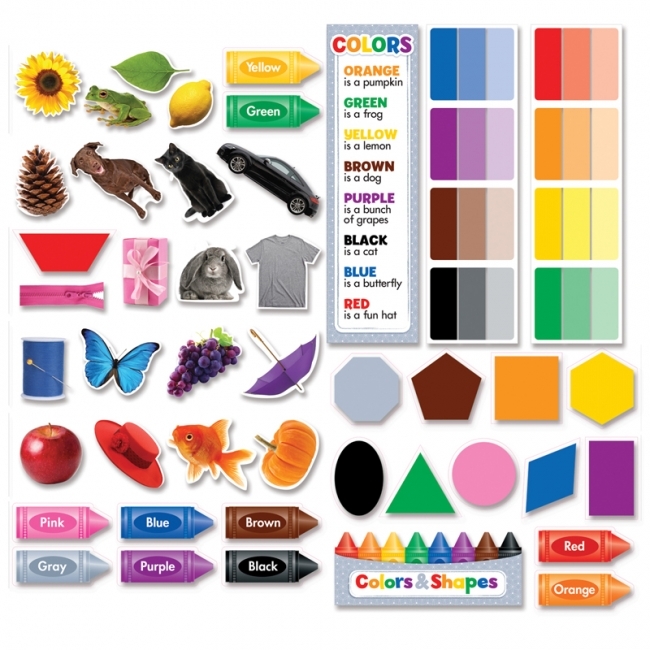 Look for coordinating products in this color palette design to create an exciting, cohesive classroom theme! 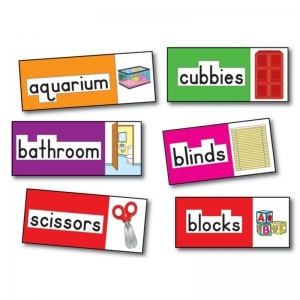 This colorful, language-themed bulletin board set supports the Four-Blocks Literacy Model. 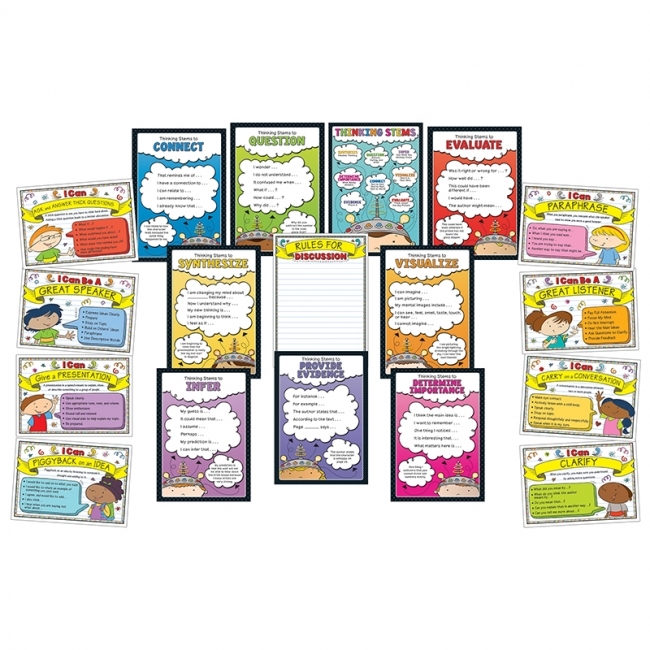 Set comes with 56 brightly illustrated word cards of familiar items. This set also comes with a resource guide. Great way to help beginning learners. 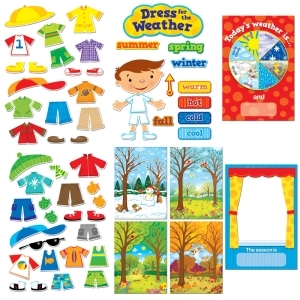 Use this fun and interactive set to teach about weather, seasonal changes, and dressing appropriately for different types of weather. 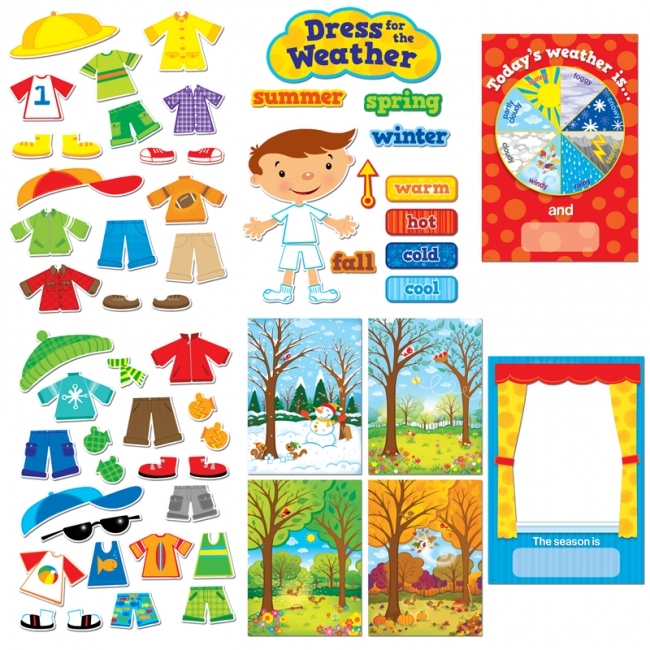 This 57-piece set contains 1 window (12" x 17 1/2") and 4 seasonal scenes; a weather spinner; 4 season titles; 4 temperature words; 1 dress-up kid (8 3/4" x 13 1/2"); and 41 pieces of clothing, shoes, and accessories. 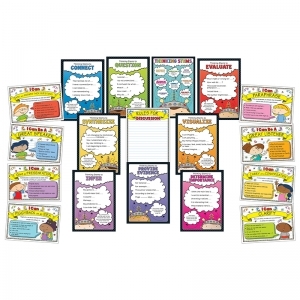 Includes 4-page activity guide with display ideas, activities, and a reproducible. 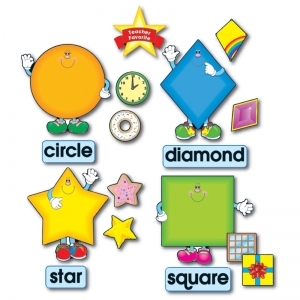 Perfect for use during circle time each morning. 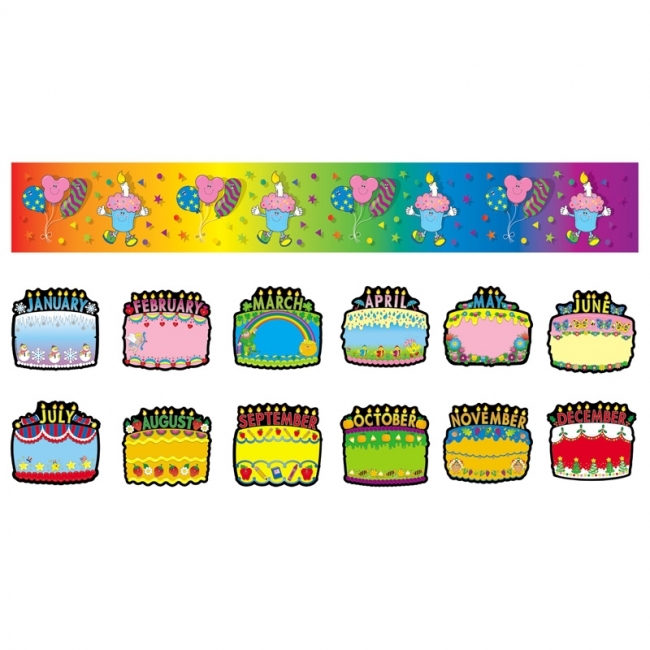 Pieces vary in size from 3" to 17 1/2". Set includes student stars, signs, decorative pieces, and a blank writing chart (17 ½" x 24"). 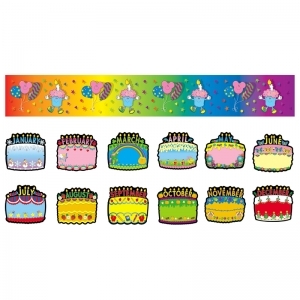 Pieces vary in size from 3" to 22". 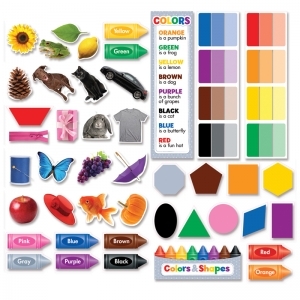 Teach color names, shape names, and more with the 50 pieces in this vibrant interactive set. The photographic images of everyday objects help reinforce the understanding of colors in the real world. Use the set's paint chips for learning activities, for mini color book covers, or to teach the concepts of tints and shades. 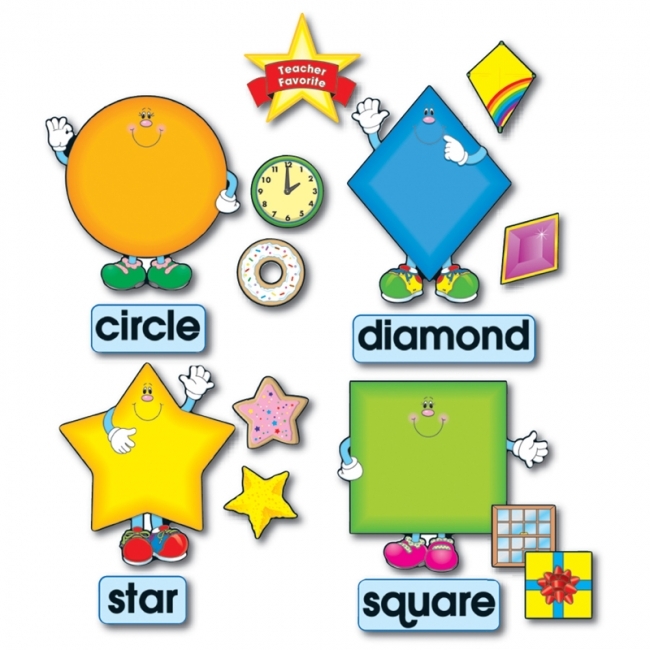 Use the pieces in a pocket chart or in a learning center to reinforce early childhood skills and support math and ELA standards. 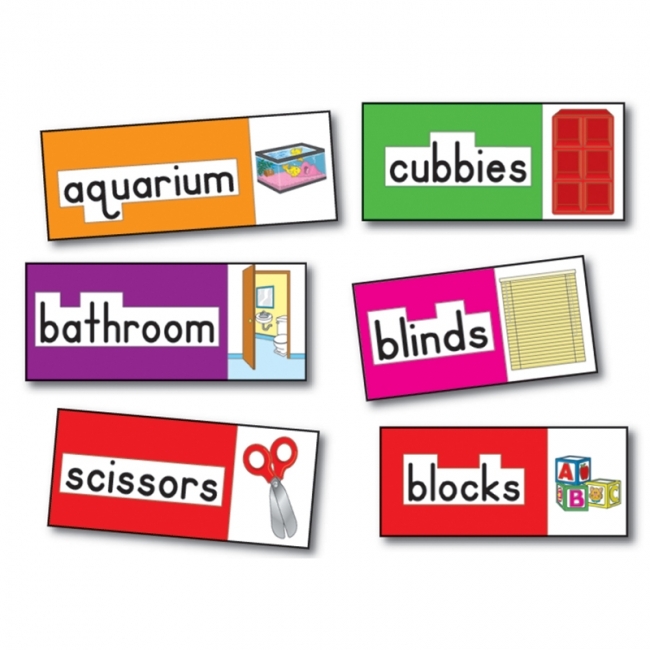 Set contains 1 Colors & Shapes headline, 10 labeled crayons, 20 photographic images of real-world objects, 8 paint chip colors, 10 geometric shapes, 1 color poem, and a guide with activity and display ideas. Includes 50 pieces, and range in size from 2.5625" x 6.625" to 13" x 5.375". 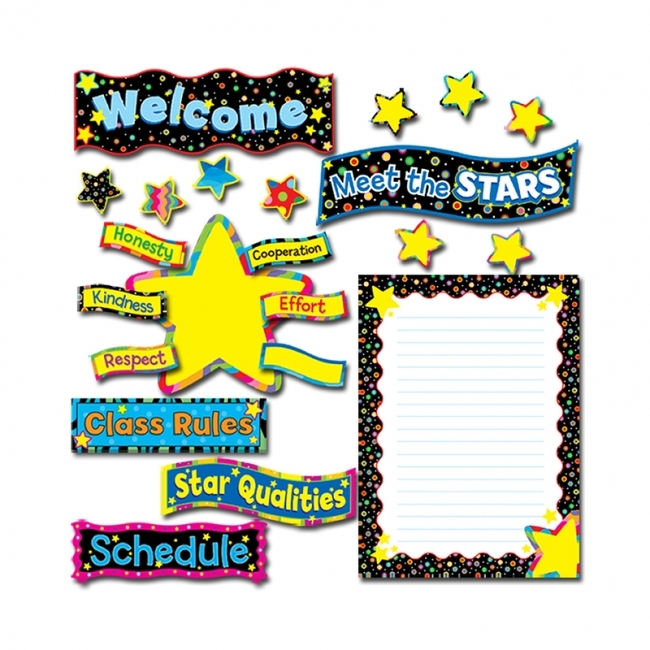 Welcome students back-to-school with Upcycle Style! In this bulletin board set, realistic looking rustic woodgrain is layered with colored textures, fun fabrics, metal accents, and playful patterns to create a cozy charm that is both modern and familiar. 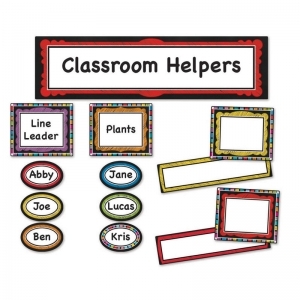 Upcycle Style will make your classroom feel warm, friendly and inspiring with its realistic looking imagery. 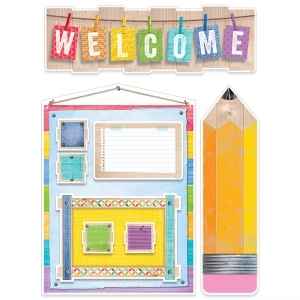 Set includes 41 pieces: a 23.25" x 7.5" welcome sign, 32 student pieces, a 17" x 23.5" blank chart, 2 blank signs and a 23.5" x 6.5" oversized rustic yellow pencil. This dimensional set is a great way to teach the 4 families of musical instruments. Panels can be used flat or popped apart at perforated lines to create a 3-D Effect. Set the stage for a fresh, new approach to music education with the Music Genres bulletin board. 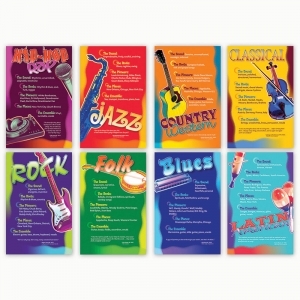 From the impromptu variations of jazz to the structured harmonies of classical music, this bulletin board acquaints students with eight top music genres, highlighting the foundations and history, as well as the signature sounds and instruments of each genre. 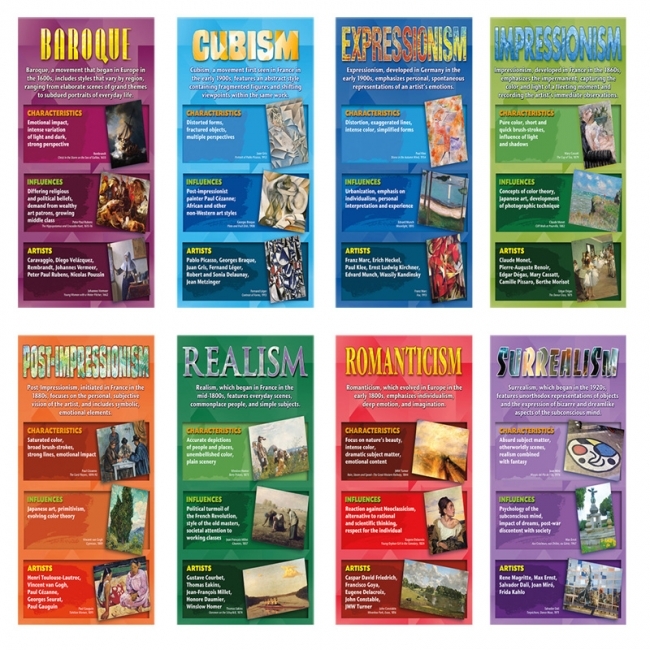 Includes eight 11" x 17" (27.9 x 43.2 cm) posters and a two-page teacher guide. 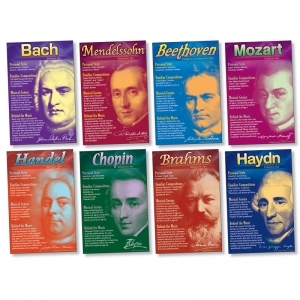 Composers Bulletin Board, 8 11" x 17" posters Engage students with an unconventional look at composers. 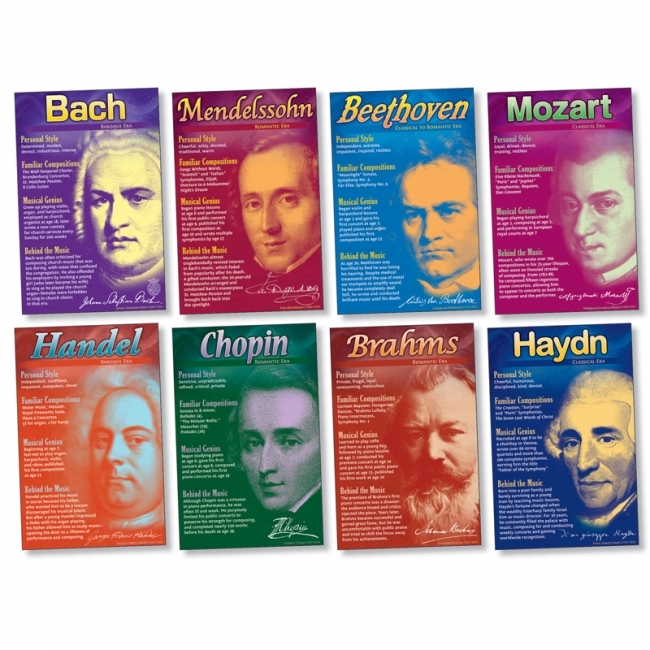 Discover famous composers' personalities, achievements, compositions, life events, and interests.